Many thanks to the curator Andrea Kopranovic and PERISCOPE art space who invited me to present reflections/notes/impressions on the exhibition. You would wonder, I imagine, why I’m here, in this space, where the exhibited artworks speak for themselves and don’t need much introduction. I was invited for this presentation, in order to unpack and unpick these works to the best of my ability and according to what resonates with my own references, the kind of art I am looking at or the books I m reading. ‘Art would like to realise, with human means, the speech of the non-human.’ This sentence was published posthumously in Theodor Adorno’s Aesthetic Theory (1970), which is full of phrases beguiling as this, always perched just between insight and jargon, ready to veer into either direction at any one moment. How far can I allow myself to speculate when imagining the speech of the non-human? One direction is that the speech of the non-human stands for ways of communication, which are precise, effective, embedded within a system and more important totally alienating if you are not part of the same species. So this is art, a system with its own internal logic, which has the capacity to render impossible, or improbable, qualities; one being to include and exclude at the same time. I think making art is difficult, writing about it is also difficult but I guess that’s why we are all here tonight because we like difficult things and we like to put ourselves in vulnerable positions. The other quality I extract from Adorno’s short definition of art aside from this paradoxical relationship to self-referentially alludes to the visceral quality, which I’d like to explore by occasionally making reference to the abject. Ernst Miesgang’s sculptures are replicas of human or animals’ organs found inside ceramic based mass produced collectibles. The membrane covering the heart for example exposes areas full of anatomical components sprouting out. They are disturbing and yet amusing. While they may seem gory and ghastly at times, they are inscribed with scientific truth downplayed by its ludic and amusing appeal. They are precious and their rather small size instigate a feeling in the region of affection. This response is immediately supplanted by a sense of being in the presence of something abject, when confronted with the overflowing guts and internal organs as if you’d open a door which once opened cannot be closed anymore. I see what I am not supposed to see. 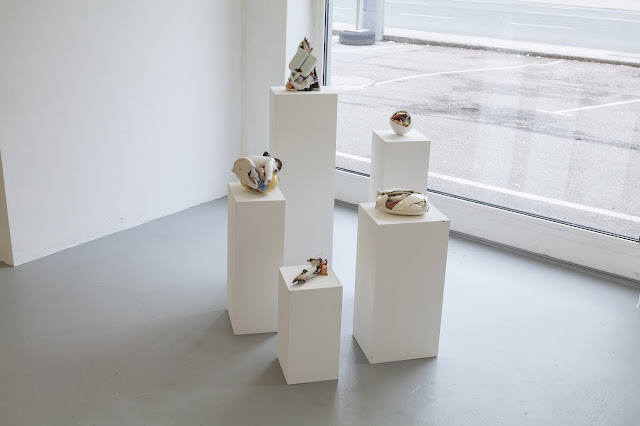 Immaculately executed, as science would require and exhibited in this way, on white plinths they become curiosity provoking specimens – items befitting a museological space; members of a class of like objects. 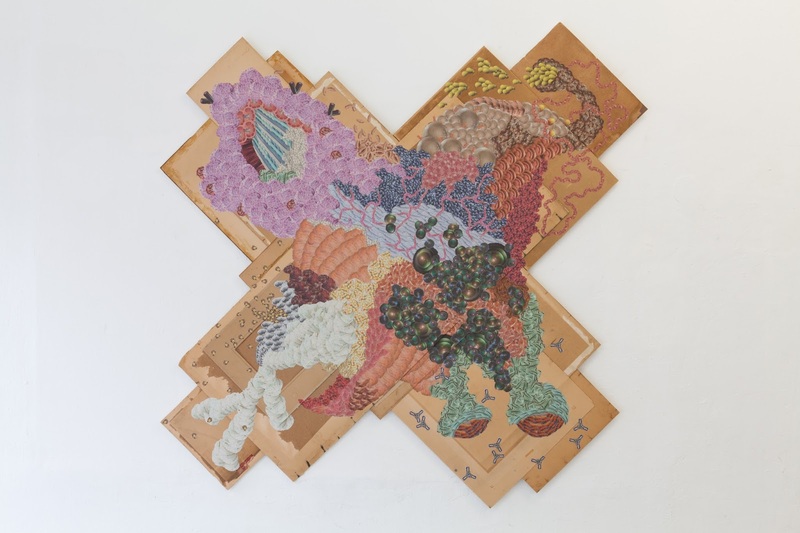 This chosen method of display only enhances Miesgang’s direct interest in scientific truth and his work undertaken within the last years, is in his own words, ‘a homage to science’, inscribed in the sculptures and collages displayed here. These decorative objects entered the common imaginair somewhere after WWII which those of us brought up in Central Europe and Eastern and, especially if you happen to come from a working or lower middle class family, like I do, remember the exotic animals, the ballerina, the bride and the groom or the Chinese lady (we in Romania got this a lot… sometimes you go to someone’s house and they would have two identical Chinese ladies or more. They were so many of them when I was growing up that to my mind it was the Romanians who invented them). As kitsch, these are quintessential objects of ideology. Gustave Flaubert decided as much on Kitsch as the organising principle for his book Madam Bovary, for which the cultural ‘geist’ was captured exclusively through the fleeting trends and shallow affective character of the popular and sentimentalist art of his day. (It is worth mentioning that while the main character Emma Bovary was too modern for her time, she also read romantic literature in her youth.) The Chinese lady of my upbringing traverses Flaubert’s romantic novels and mannerist hand made statues of his 19th century, winding up as the epitome of 20th Century kitsch for which the ‘mechanical reproducible’ has culminated in a veritable abyss of kitsch production. The unassuming brevity of the term ‘post-fordist’ appears designed to allay the mental (and ethical) exhaustion of trying to conceive of the terrifying scale and force of production and its counterparts, in our historical moment. Kristeva defines the abject in a non-definition, one that is there but she cannot display in words. Being a music fan is no lesser than a fervent God worshiper and a tissue impregnated with Madonna’s sweat (as in the pop start) can be as sought after as Jesus’ shroud or a lover’s bodily traces. Being a music fan was previously explored by Sigrid in This combination is not recommended (2017), realized in collaboration with artists Karina Kueffner and Julia Gutweniger. This work invites visitors to pick up onl y one copy from the two stalk of postcards representing the two Modern Taking German band members, Thomas Anders and Dieter Bohlen, signifier of a past its glorious moment mass cultural product. The title of this exhibition was selected by Krenner and it follows from her practice of using phrases heard in the street from passers-by, which make an impression on her. One could call it the poetry of controlled randomness. From what I gather by using google translate and asking Sigrid for clarification since I don’t speak German, the title KOMPLETT FAST plays with the essential indeterminacy of words since it could also be FAST KOMPLETT. It sounds like a product of google translate, which can actually produce involuntary poetry. In his quest to find the sublime in the nonsense, the play writer Eugene Ionesco proposed translating texts literally just as google translate does now. The work Sigrid is presenting here borrows the title from a computer update A condition analysis is carried out (2017) and is formed of a replica of a found wood cabinet (perhaps suitable to display Sigrid’s reworked collectibles, just like I used to see in my childhood) into a non-functional, mysterious object complete with a multi-colorful wrapper found in the drawer. 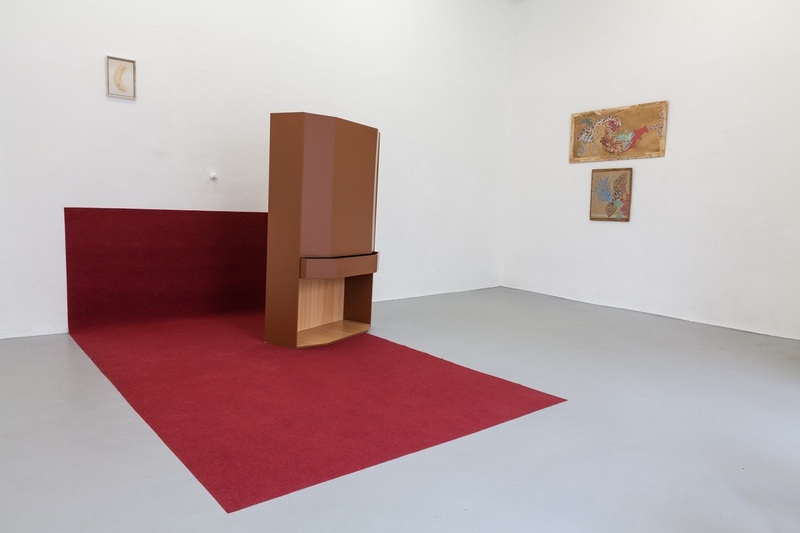 This cabinet, a rip off of late Modernist style is placed on a simple, red carpet, which in a surrealist twist covers the floor and the wall. A framed photograph of a peeled banana hangs unassumingly on the wall. The banana is a recurring artistic devise in her practice, an interest she has in bent, elongated objects turned motiff, which she previously explored in drawings and ceramic works. All three objects composing this work together with Miesgang’s sculptures, which previously inhabited someone’s living room before being discarded to the flee markets are 1:1 representations, which only add to the feeling of domesticity recreated in a theater setting like situation, where something is about to happen. Within this setting, the banana gives the impression of a crescent moon, evoking, in turn, perspective via this nighttime ‘horizon’. The wrapping paper becomes here a signifier of randomness and how contingency plays a fundamental role in meaning formation. for the current exhibition. In 2016 Miesgang started the series of collages titled Critters. He explained to me his working method which implies dozens of litter newspapers with the same date, which he collects from European cities he finds himself in. Some images or shapes he finds attractive are ripped off by hand and then glued together to create these in between anatomical details and underwater formations created in the dark. Again, as in his sculptures, I’d like to suggest that we are presented with something we are not supposed to see but which is nevertheless part of our environment. The cardboards on which these collages are made force in their own history since they actually are the backsides of paintings or photographs he had found in the flee markets of Vienna, where he lives and works. Miegang’s collages can take different shapes but the one exhibited here stands out. It is a reminisce of a franc-masonic logo or some kind of esoteric sect. It is a signifier of the times are all experiencing at the moment, a depressing post 2008 era for Europe, where sadly we have been noticing an increased need to engage in essentialist and populist narratives. Because these cardboards are so precious they actually determine the working method to a certain extend since one cannot start all over again as you’d do with an easily replaceable canvas. Like in the sculptures, where there is no definite control over how the cracks will turn out, the cardboards with their stains and traces of time are incorporated in the process making and impact the final outcome allowing for the contingency to play a significant role. I will conclude with a few last ruminations on Sigrid and Ernst. Both artists operate with the element of contingency. Both artists recycle leftovers, which worked their way over time into obscurity, whose peak has passed and turned culturally obsolete. The title of the exhibition and of Sigrid’s works reveal the limits of language and they too function as found objects, still adrift, which as if almost by accident they have been illuminated as ‘work’. If artists’ intentions from the outset are different, where Ernst uses scientific truth while Sigrid favours the contingency, their interest in the mundane, in recycling found objects and perhaps exploring the theme of the abject create a productive tension.